For spa breaks in Scotland, Aberdeenshire offers visitors a wealth historic buildings and beautiful countryside. 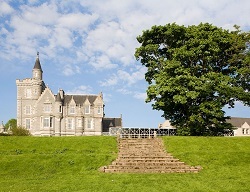 The city of Aberdeen is a bustling cosmopolitan area with fantastic shopping centres and boutique shops. Stay on one of our hotel breaks near Aberdeen and you’ll be able to take the opportunity to relax and unwind with a spa treatment or two and take in some of the attractions set in the fabulous surrounding scenery. From crumbling castle’s to perfect beaches with amazing wildlife thrown in to boot you really can get away from it all in this stunning area of Scotland. The largest National Park in Britain can be found in the Aberdeenshire area. With breathtaking countryside and rugged coastline the Cairngorms National Park is a place to get up close with nature. It might be worth adding a couple of extra nights on to your spa break in Scotland as there is so much to do. Explore quaint fishing villages and sample some of the delicious freshly caught seafood. Looking for a gift to take home? Then visit one of the local independent galleries and art and craft shops to find quality items locally made in the Aberdeenshire area. And let’s not forget that you can take a trip to one of the oldest Whiskey distilleries in the world. Find out what is involved in making the most perfect whisky by going behind the scenes. They’ll be a dram waiting for you at the end. Enjoy a spa break package in Aberdeenshire, you’ll be able to stay for one or two nights (longer if you wish). Dinner and breakfast is generally included on all of our spa breaks plus you’ll get at least one spa treatment each. Use of the leisure facilities and swimming pool is also included in all of our breaks in Aberdeenshire (where leisure facilities are available at the venue).